Class equipment boxes in a modern look with which you can travel by the water. For all anglers who are looking for a handy organizer for small to medium art baits plus accessories. 4 Removable boxes (dimensions: 22 x 13 x 3cm) with variable compartment arrangement. 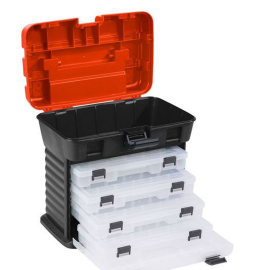 The upper compartment offers storage space for larger accessories such as pliers, knives, coils etc.